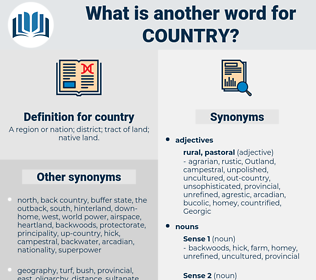 What is another word for country? A region or nation; district; tract of land; native land. Islands, Periodicals, IDPS, silos, aims, nation, nations, Its, tips, state, states. data, audits, country-level, countries., nation, state, states. accomplished, polite, nonagricultural, metro, urban, refined, nonfarm, urbanized, polished, urbane, citified, cultured, elegant, municipal, metropolitan, well-bred. If you get out of this country, you'll be down and out. I always felt you would come back to this country again. centare, commuter, candour, coconut tree, commentator, commentary, commodore, commandeer, contour, centre, candor, chantry, cometary, center, cassandra, china tree, cnidaria, centaurea, chanter, comandra, contrary, commandery, cemetery, century, comminatory, common meter, counter, centaury, condor, commutator, canter, cinder, commander, coconut water, cantor, candidature, cosignatory, centaur. banana republic, fatherland, country of origin, South American Country, Asian Country, buffer state, motherland, African Country, sultanate, mother country, homeland, North American Nation, North American Country, Asian Nation, African Nation, South American Nation, kingdom, native land, European Nation, buffer country, tax haven, European Country. territorial division, administrative district, administrative division. demesne, domain, department, land, state, province, midland.